Fat Dragon Games takes you underground with their latest paper terrain set. These are the Mines of the Mountain King. 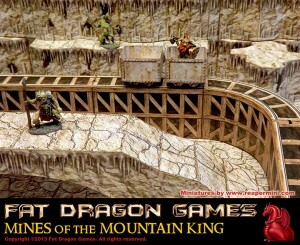 Mines of the Mountain King is the second release of Fat Dragon Games' unprecedented epic dwarven citadel terrain series. The E-Z LOCK terrain system allows you to create fully modular 28mm scale terrain layouts for your RPG or wargame, in a downloadable PDF format, and once you have the set you can print and build as many pieces as you like and never run out or need to purchase more. Additionally, our layer options allow you to customize your terrain to suit your tastes. This new PDF terrain set features our exclusive modular E-Z LOCK terrain designs, allowing you to disassemble and easily store your designs between games.